I'm a celebrator. 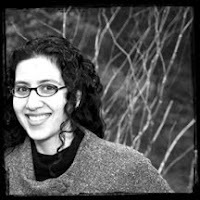 Just to be clear: not the kind with a party hat and noisemaker, screaming at the top of her lungs at the strike of midnight on new year's eve. Can you see me doing that? I didn't think so. I'm the kind who seizes an opportunity to let myself celebrate--having fun with a new reason to enjoy life, enticing those around me to join in, then siting back with a smile on my face to take it all in. When the Pens came over to my house for dinner a few months ago, we hadn't gotten together as a group in a while, so I wanted to do something a little special. 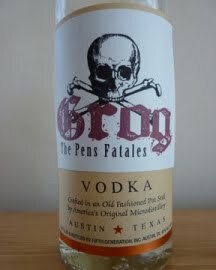 Since we conceived of this enterprise as a "Grog" (group blog) I designed a Pens Fatales label for some Grog for us to imbibe that evening. (OK, it was vodka, since who really wants to drink Grog?) It made the whole thing seem more festive. More like a celebration. A small experience sticks with me that sums up this feeling. On a miserably freezing, wet day, I ducked into The Cafe in the Crypt for a cup of coffee to warm up. The person I was with snagged a table while I waited in line. I returned to the table with not only coffee but also a luscious bread and butter pudding to share. I was soaking wet, and the crypt was more crowded than atmospheric, but I had good company and a warm, buttery treat, so what more could I ask for? The person I was with could see it on my face. She turned to me and said "You really enjoy life, don't you?" That's exactly how I was feeling on that cold winter day. I think one of the reasons I'm so bad at establishing celebratory holiday traditions is because I always want to try some new experience. Until a few years ago, I bounced around from place to place a lot, and was rarely "home" for the holidays. Instead of having a specific tradition, to me celebrating is about the people you're with and the experience you're having together. I remember the Christmas Eve dinner at a cozy little pub in London with tiny little booths and a huge roast, getting to know a new friend a little better who has since turned out to be one of my closest friends. And the New Year's Eve in Cornwall, in a b&b whose owner wore a reindeer hat while serving rich treats and hosting silly games. 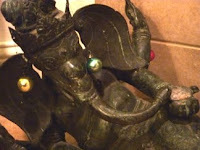 And of course there are the times I made it home to visit my parents, wherever they happened to be living at the time, for wonderful visits surrounded by Christmas ornaments placed on all of the cultural artifacts throughout the house. For me, those visits are most worth celebrating because they're not a given. I've always been of the opinion that I don't know what adventures life has in store for me, or what the future holds. So I'll celebrate with my friends and family as I go along each step of the path. thanks for the reminder that celebration is where you find it. lately i've felt a little sad about the thought of the kids being gone, of moving from the homes they've known, wondering if we would be able to recapture holiday spirit in new surroundings. your parents are awesome, of course, but maybe i too can create that for my own kids. You DO always seem to enjoy life. It's a remarkable, enviable trait. I know, I was all about going to that cafe, too.... We will! And you really DO celebrate life. I can just see the smile you had on your face when you brought the treats to the table. Yay for this!